Sign up or Log In for access to the Recording Library. Are you a healer or healthcare practitioner? Do you want to learn more about the multi-dimensional aspects of healing? Our world is shifting from the third dimensional reality into the fourth. Each dimension is a different vibrational state that perpetuates certain perceptions and attitudes. In fourth-dimensional awareness, intuition develops more fully, stimulating expansions of the five senses to perceive what is not on the physical plane, increasing empathy, precognition, dreams and healing abilities. Connections are made with spirit guides, angelic beings and alien races. Becoming comfortable with your gifts and developing relationships with other-dimensional beings can enhance your healing (or your healing practice) and expand your own skills. 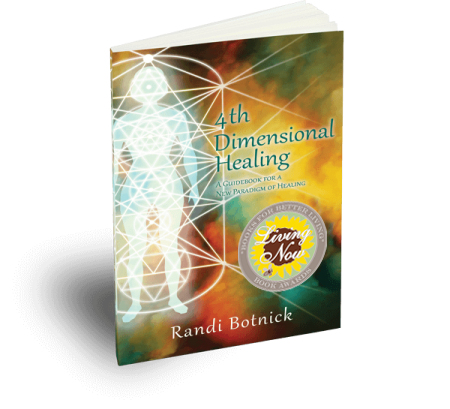 This book is what Randi Botnick wished was available when she was starting out as an energy healer two decades ago. It is replete with information about perceiving and accessing your intuitive abilities, recognizing the energy bodies that influence our physical experience, and understanding the spiritual realm. Also included are examples of Randi’s healing techniques and processes. Would you like to hear more? Listen to radio interviews of Randi on the Well Being Radio Show (airdate 11/16/15) and on Kardec Radio (airdate 12/5/15).